If an article is posted on the Internet and Google doesn't index it, would it have an impact ? I've been following posts about copyright in the last few weeks. Tim Hall and Brent Ozar both take issue with plagarists stealing their content. Firstly, I'm personally not worried about theft of my content. But then I'm not in the league of Tim or Brent. When I get around to it, I'll rejig the blog layout so that each page has this Create Commons licence. But the wider issue is a technical one. The internet is a lot about digitizing content, duplicating it and distributing it. The music and movie industries have battled this for a while, and not done too well. But, through the CodingHorror blog, I see that YouTube is applying technical solutions. Basically when material is uploaded, they run it through some algorithm to try to determine if it is copyright. So I figured, how could this apply to text-based content. The key is Google, who happen to own YouTube. Yes, there is Bing and Blekko and Wolfram Alpha. There was Cuil, which died quietly a few months back. But Google is search. It would be quite feasible for Google to implement some plagiarism block. As I indicate in the title, if internet content isn't indexed by Google, it comes pretty darn close to not existing in any practical terms. I write a blog piece and run it through a Google Signature Recorder. It picks out, or has my assistance in picking out, some key phrases. Then, as they index the internet world they check out for other sites with those key phrases. If they find one, they report it to me. I can either mark it as 'OK, licenced, whatever' or I hit the veto button. If I do that, they pull the offending pages from their search index. Worst case, if they find 80% of a site is offending content, they could decide to remove the entire site from the index. Removing the offending site from their index doesn't hurt the search facility. The original content is still there. They can even do 'magic rewrites' to count pointers and links to offending content as pointers to the original for PageRank purposes. What might their motivation be for this ? With Youtube, where they are hosting the service, it may be part legal necessity. But they host Blogger and Google Docs too. More than that though, this could be a service they could sell. If my content is valuable enough for me to want to protect it, I can afford to pay Google $50 a year to monitor it. The advantage of making this a paid service is that, if there is a challenge (maybe Fred says I've registered his content), there is a financial paper trail to follow. Ultimately, as YouTube isn't obliged to host your videos, Google isn't obliged to index your content. Time for another chapter, or at least verse, in the Apex security model. 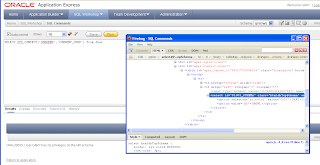 With Apex, the relationship between Workspace and Schema is flexible. 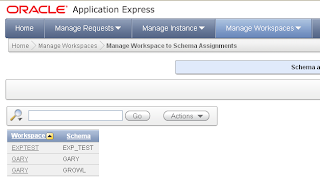 A single schema can have multiple workspaces against it, and a single workspace may be assigned multiple schemas. 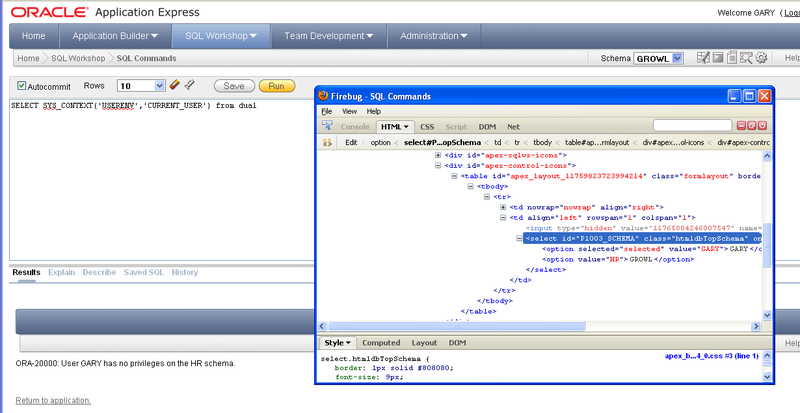 I’ve only worked on a couple of small Apex jobs, and have kept a one-to-one mapping between workspace and schema. That seems simpler to me. In this example, the GARY workspace has two schemas, GARY and GROWL. Going down a level, when you create an application under a workspace with multiple schemas, you pick one of them as the base schema for the application. That schema will be the ‘effective database user’ in terms of privileges. Things are a bit different in the Workshop. The workshop belongs to the workspace and doesn’t have a single schema. Instead you get the drop-down list near the top-right corner. You choose the schema (out of the allocated schemas) and it runs as that user. Except, perhaps, in Nuno’s installation where he is seeing some odd results. 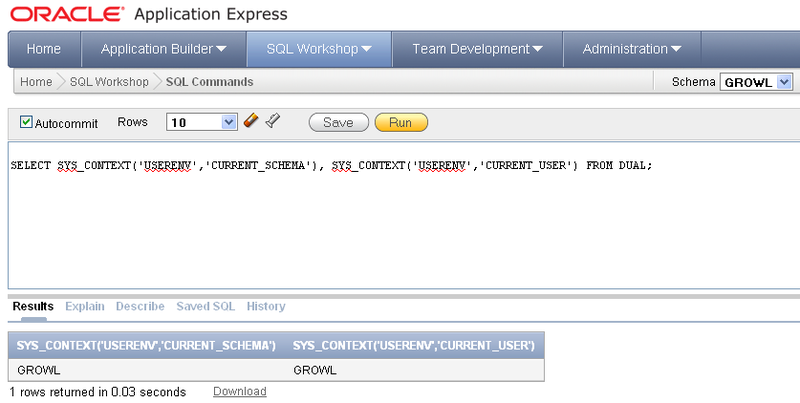 As an amusement, I tried fiddling with the HTML to see if I could run SQL as a schema not linked to the workspace. It didn’t work and just raised an application warning (ORA-20000, rather than a built-in warning) that stated I didn’t have the authority on that schema. Prompted by James Koopmann's post about default Oracle accounts. "The good thing here is that many of these accounts, after a normal installation are expired and locked"
Being blunt, "EXPIRED & LOCKED" does not mean safe, unbreakable, unusable or ignorable. EXPIRED means that you cannot use the account password to access the account. My trick from last week would still allow access through a proxy account. LOCKED is a bit better, as is lacking a 'CREATE SESSION' privilege. But even if FRED is locked, nothing stops user BARNEY using any available grant to run a procedure owned by FRED, and if that procedure is the default DEFINER RIGHTS, then it runs with an privilege granted to FRED. This is why SQL injection vulnerabilities in code owned by these LOCKED schemas are still dangerous. Lets have some fun with APEX. Brand new user, nothing up my sleeves. Five basic privileges and not even as many as recommended in the documentation. Those privileges are sufficient to create an Apex workspace for the schema though. A Workspace has an ADMIN user and you can log into that workspace as the ADMIN user. You can have other users (developers or plain, apex-authenticated users) on the workspace too. Still accessible through Apex. No worries about the account being locked or passwords being expired. 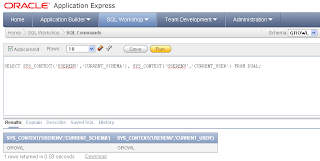 I've done that using XE with Apex 4.0 and the embedded PL/SQL Gateway. Obviously the account you use to connect to the database needs to be unlocked, with CREATE SESSION and an unexpired password. But beyond that Apex uses magic (or rather, I believe, DBMS_SYS_SQL). You can log out of one apex application running in a workspace on schema FRED, log into another running against BARNEY and it's all using the same set of database sessions. The apex builder/administration application is all running in Apex as well, on the same connections, with all its majestic power. So an expired and locked account still has enough oomph to bite your legs off.